If you look on the back cover of Timesplitters 2, and happen to notice a monkey with a gun...relax. It\'s all a part of the intense ride that TS2 brings on Gamecube, PS2, and XBox. As the story opens, you find yourself one of two special agents sent in to take down a species of aliens known as the Timesplitters. 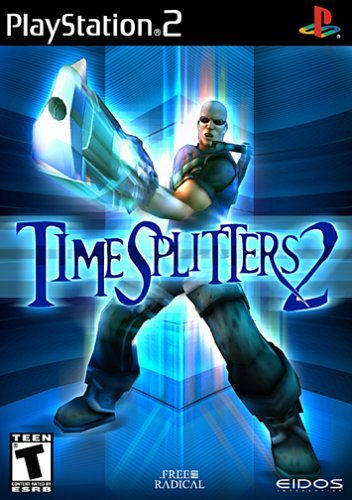 The Timesplitters\' intent is to disrupt humanity\'s history by running amok in the past, present, and future. Not exactly a gripping plot, but, hey, gives you an excuse to shoot things, right? Plot, shmot. Who needs plot when you have gameplay? In this area, TS2 delivers in full force. There\'s something about sprinting around different eras of time, with the weapons of choice for each time period, blowing away all and sundry that makes for interesting, if not repititious, gameplay. The action is hot, heavy, and fast-paced. Stop to think, and you\'re dead. The controls for Timesplitters 2 are pick-up-and-play, making good use of the dual analog and shoulder. Any other buttons are rarely used. The controls respond nicely and smoothly, allowing precise aim without sacrificing speed. Difficulty is all about how you set it. With three separate difficulty levels with different objectives, the single player mode will keep you going for a good long time. So fast, so furious...Timesplitters 2 multiplayer gameplay comes down to one word: Whoa. TS2 delievers over 10 arenas and over 100 unlockable characters. But all those characters have unique stats, such as speed, accuracy and stamina. For example, the monkey(yes, a monkey) can run fast, shoot quick, and has all the health of a pot of tulips. On the other hand, a hulking robot can take plenty of guff, but runs at the speed of a hippo on ice. With 15+ modes of play, you will never grow tired of multiplayer TS2, because there\'s so many ways to play. Well, I\'m happy to report that, while there is violence galore, there is no blood in Timesplitters 2. None. Nada. Zip. Zilch. There are a lot of immodestly dressed women in the game, but as long you keep your mind out of the gutter, this is a fabulous game that you can play guilt-free.